"High Flight" by John Gillespie MacGee, Jr. When I was boy growing up in the 1960s and early 1970s, I’d sometimes stay up too late watching television. I’d usually fall asleep during some movie classic, then wake up just as the station was about to sign off. I remember the clip below, a devotional of sorts, being shown just before the test pattern would appear. The poem has stayed with me over the years. When I found myself quoting part of it to my family just before Christmas, I decided to do some research. 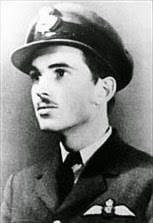 It turns out that John Gillespie Magee, Jr., a World War II Royal Canadian Air Force pilot, wrote the sonnet “High Flight” while training in England in 1941. He died tragicallyless than four months later after a mid-air plane crash. He was only 19. Such sentiments are not commonly expressed these days. Please let me know if you remember the clip from your childhood. I don't remember ever seeing the clip, but I do remember this poem. I love this poem. I always have but never really knew the story behind it or where it came from. His words actually inspired me to pen my own poem many, many years ago in my youth. Thank you for sharing this. Thanks for sharing, Natalie. I've always like this poem too.